and light weight (i.e., the Mk II/III Scripps receiver contains a 1.5m long vertical dipole) (Constable, 2013). 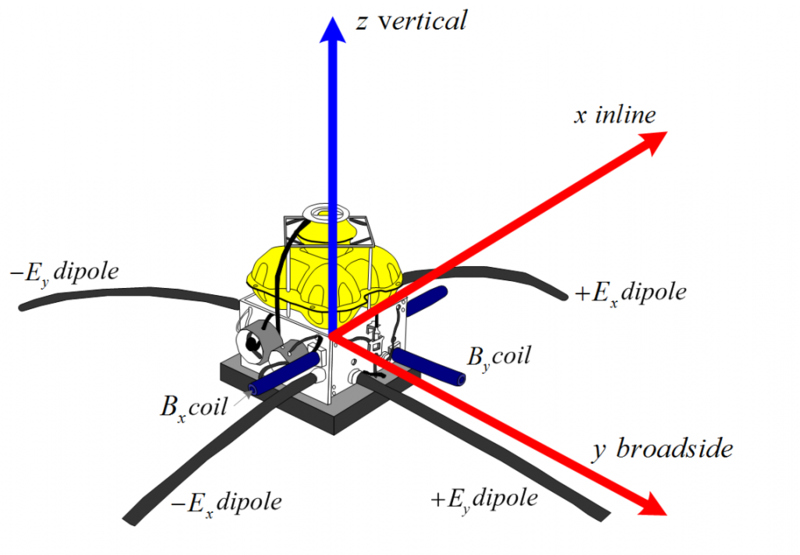 The magnetic field is typically recorded by light weight induction coil magnetometers (Key, 2003) (See Figures 1 and 2 The typical components which are detected by commercial designs are x and y magnetic and x, y and vertical electric field directions. The vertical magnetic field is insensitive to thin resistors such as hydrocarbon. The magnetic field sensor is also heavy and its addition to the receiver greatly increases cost. Many commercial operators omit this sensor from their equipment as a consequence of this. There are numerous receiver parameters to be considered when choosing the most suitable receivers for the survey (as seen in Table 1). Key attributes to consider when planning a CSEM survey include the noise floor of the instrument, timing calibration, timing stability, battery type and energy use, recording capacity, response calibration, navigation and seafloor orientation. Receiver navigation can be poor (e.g., receivers positioned greater than 5 m accuracy) and can introduce measurable variation (i.e., greater than 1%) at short offsets. The electronic dynamic range of instrumentation is important because of large variations in the signal strength. For instance, electric field voltages can range several orders of magnitude (i.e., to or lower). 24-bit analogue to digital converters with pre-amplifiers enable high resolution data to be recorded at all source-receiver offsets without signal saturation (Phillips, 2007). Table 1: Typically encountered receiver features and attributes. These values have been taken from two commercial contractors, OHM’s EFMALS III (OHM, 2008) and WesternGeco (WesternGeco, 2008) receivers. At 0.1 Hz the average recording period is 10 s and the total noise (vn) is RMS. Commercial EM receivers operate with an electric dipole arm length of 8 to 10 m, however newer lower noise models have been developed to operate with an electrode spacing of 1 m (Quasar, 2012). Their receiver is seen in Figure 3. Commercial operators transmit a high amplitude current in excess of 1000 A at peak output. The higher the transmitter moment, ( , where is a transmitter length and is current) the better the signal to noise. The noise floor for a 100 m long transmitter operating at 1000 A is at 0.1 Hz is given by equation (3). This electric field noise floor is close to the values achieved in very deep water marine CSEM surveys. The antenna length can be extended to improve the signal to noise ratio of the receiver. This voltage is proportional to the receiver dipole length (Flosadattir and Constable, 1996). Synchronous stacking can be also used to recover a repetitive signal from the random ambient or instrument noise. The limits and features of electromagnetic systems over next few decades will improve with technological advancements. Hence the features seen in Table 2 should only be taken as a guide. In summary, the main features to consider when planning a survey are the noise threshold of both the E-Field and B-Field sensors and which electric and magnetic axial directions the device will record. Figure 2: A receiver from the Scripps Institution of Oceanography. The receiver has all components except the vertical magnetic field. This image was obtained aboard the Scripps Institution of Oceanography’s ship, R.V. 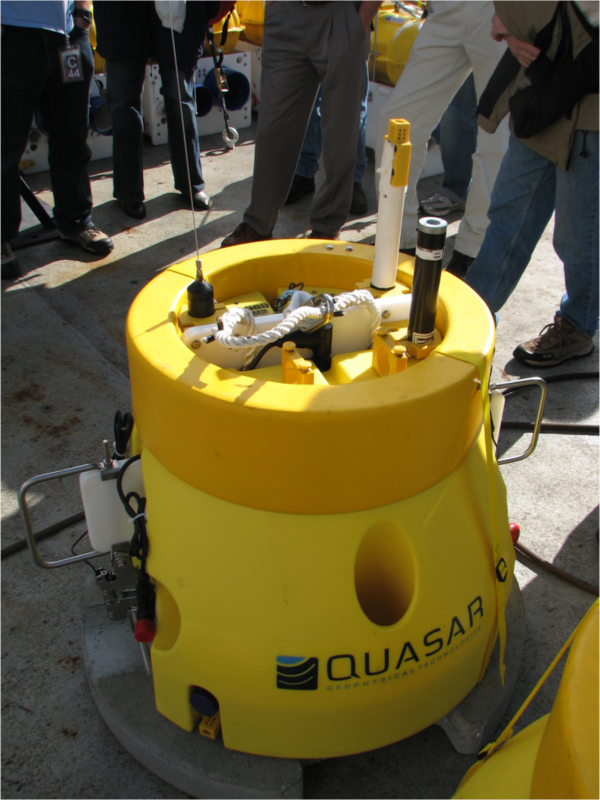 Roger Revelle, 2008.
underwater sensor they developed for the U.S. Navy and redesigned it for ocean bottom surveying with its QMax EM3 underwater electromagnetic receiver (Quasar, 2012). It is the only ocean bottom CSEM receiver to contain all six electric and magnetic components. This image was obtained aboard the Scripps Institution of Oceanography’s ship, R.V. Roger Revelle, 2008. Constable, S. (2013). Review paper: Instrumentation for marine magnetotelluric and controlled source electromagnetic sounding. Geophysical Prospecting 61, 505–532. Constable, S. and C. J. Weiss (2006). Mapping thin resistors and hydrocarbons with marine em methods: Insights from 1d modeling. Geophysics 71 (2), G43–G51. Constable, S. C., A. S. Orange, G. M. Hoversten, and H. F. Morrison (1998). 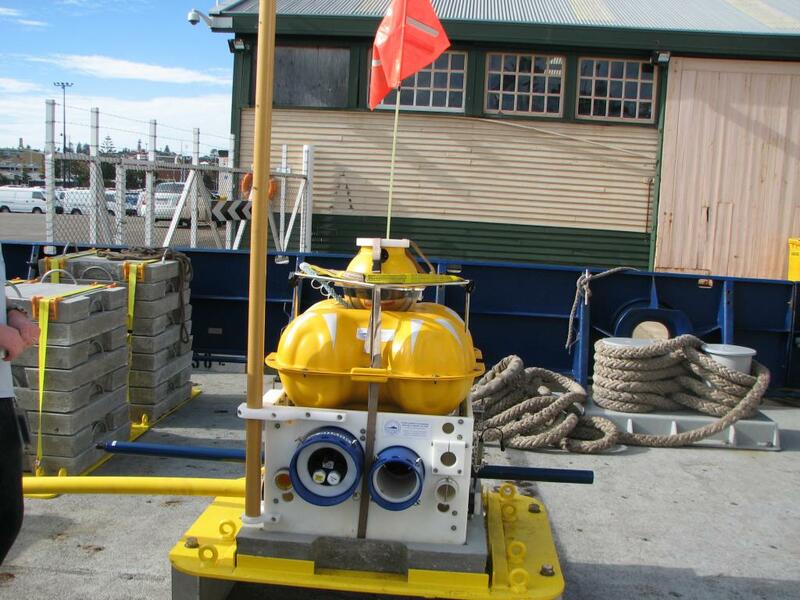 Marine magnetotellurics for petroleum exploration; part i, a sea-floor equipment system. Geophysics 63 (3), 816–825. Flosadattir, A. and S. Constable (1996). Marine controlled-source electromagnetic sounding 1. modeling and experimental design. J. Geophys. Res. 101 (B3), 5507–5517. Hoversten, G. M., F. Cassassuce, E. Gasperikova, G. A. Newman, J. Chen, Y. Rubin, Z. Hou, and D. Vasco (2006). Direct reservoir parameter estimation using joint inversion of marine seismic ava and csem data. Geophysics 71 (3), C1–C13. Key, K. (2003). Application of Broadband Marine Magnetotelluric Exploration to a 3D salt Structure and a Fast-Spreading Ridge. Ph. d.
MacGregor, L. M., S. Constable, and M. C. Sinha (1998). The ramesses experiment iii. controlled-source electromagnetic sounding of the reykjanes ridge at 57°45’n. Geophysical Journal International 135 (3), 773–789. OHM (2008). Ohm surveys. www.ohmsurveys.com. Phillips (2007). Feasibility of the Marine Controlled Source Electromagnetic Method for Hydrocarbon Exploration. B.sc. Quasar (2012). Quasar geo. www.quasargeo.com.